Making homemade yogurt is easier than you think. 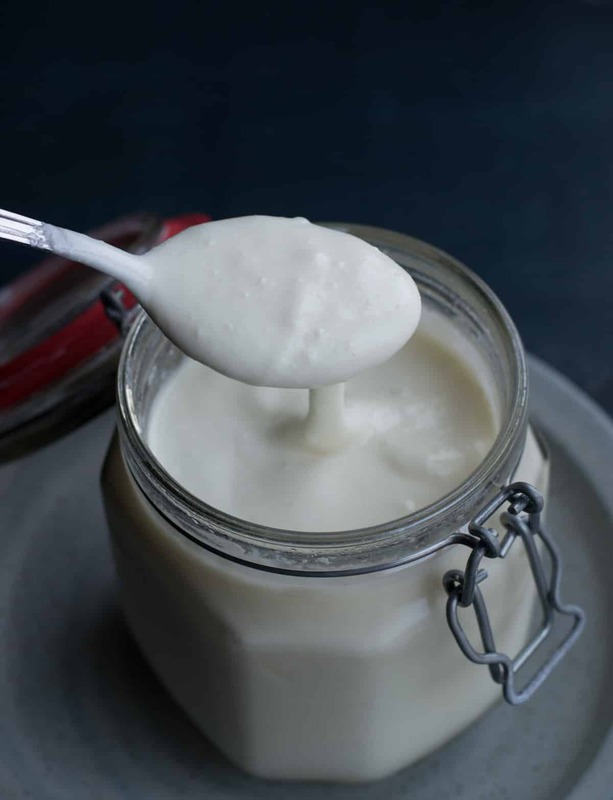 Learn 4 fail-proof ways to make homemade yogurt the traditional Indian way as well as with an Instant Pot. 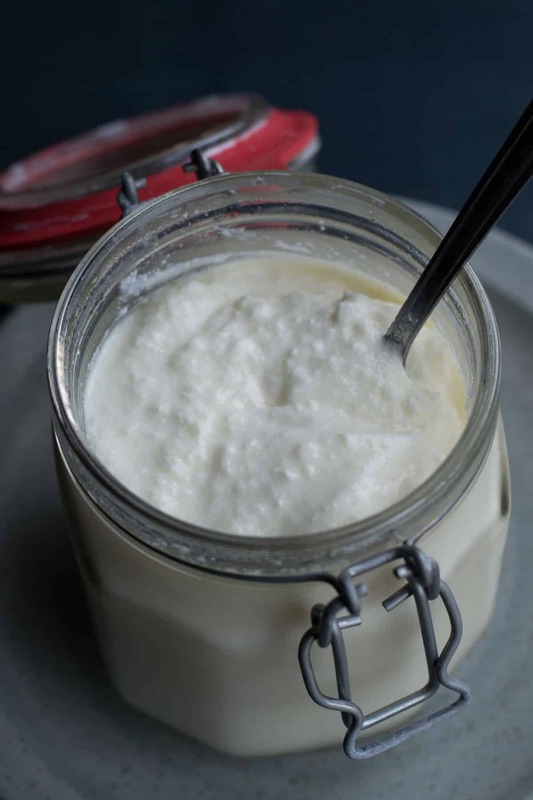 Do you make yogurt or curd (as we call it in India) at home? I normally don’t but when you have just bought the 7-in-1 Instant Pot with yogurt function, it is hard not to check out that much-touted yogurt function. I love experimenting in the kitchen. That is why I not only made yogurt in the Instant pot but also made it the traditional Indian way (over a gas top) to see how they compare. I am so excited to share the results. But before we do that, let’s look at the different ways to make yogurt with and without Instant Pot and we will review the results right after. In a saucepan, add 4 cups of whole milk and let it come to boil. Turn off the gas and set the saucepan aside. Let it cool for around 45 minutes. Let the milk cool to below 115F or 46C. You can use a thermometer or a clean finger to get a feel for the temperature. When using your finger, the milk should be lukewarm to touch and not scorching hot. Add the yogurt to the milk and mix well. Cover the saucepan and place it in a warm place to set. In winter months, keep it in the oven with the light on. The yogurt should be ready in about 8 hours. Note – You can either let the yogurt set in the saucepan or transfer the milk-yogurt mixture to another container to set. Saucepan + Instant Pot + glass container method where milk is boiled in the saucepan and allowed to set in Instant Pot. Follow steps 1 and 2 from the traditional method above. i.e Boil milk and let it cool down. Pour the milk-yogurt mixture into a clean glass container. Turn the Instant Pot on. Add a cup of water to the steel insert in the Instant Pot and put the steam rack in. Place the glass container on top of the rack. Press the “Yogurt” function key. Adjust the time using “+” and “-“ keys if needed. I set it up for 8 hours. Close the lid. The program will start in 10 seconds. When the program is complete, Instant Pot will beep and the display will show “yogt” and moves on to the standby state. Instant Pot + glass container method where milk is first poured into a glass container which is then boiled as well as set in Instant Pot. This method takes 30 minutes for the steam to release + another 45 minutes for the milk to cool down. Turn the Instant Pot on. Add a cup of water to the steel insert in the Instant Pot and put the steam rack in.Place the covered glass container containing milk on top of the rack.Close the Instant Pot lid. Select the “Steam” function and set the timer for 1 minute. Once the process is over, use the “Natural Release” method to release the steam i.e let it cool down on its own. Takes about 30 odd minutes. Press the warm/cancel key to turn off the Instant Pot. Open the Instant Pot and uncover the glass container. Take the glass container out and let the milk cool to below 115F or 46C. That should take around 45 minutes.You can use a thermometer or a clean finger to get a feel for the temperature. When using your finger, the milk should feel lukewarm to touch and not scorching hot. Add the yogurt to the milk and mix well. Turn the Instant Pot on. No need to add additional water. Place the glass container back on top of the rack. Press the “Yogurt” function key. Adjust the time using “+” and “-“ keys if needed. I set it up for 8 hours. Close the lid. The program will start in 10 seconds. When the program is complete, Instant Pot will beep and the display will show “yogt“ and moves on to the standby state. Add milk to the inner steel pot. Press “Yogurt” and then press “Adjust” to the “More” mode and you should see the word “boil” on the display. The milk will start to boil. When it’s done, Instant Pot will beep and display “yogt”. Press the warm/cancel key to turn off the Instant Pot. Open the Instant Pot. Let the milk cool to below 115F or 46C.It should take around 45 minutes.You can use a thermometer or a clean finger to get a feel for the temperature. When using your finger, the milk should be lukewarm to touch and it should not be scorching hot. Add yogurt to the milk and mix well. Press the “Yogurt” function key. Adjust the time using “+” and “-“ keys if needed. I set it up for 8 hours. Close the lid. The program will start in 10 seconds. When the program is complete, Instant Pot will beep and the display will show “yogt” and moves on to the standby state. Taste and Texture difference – There were no remarkable taste or texture difference that would make me choose one method over the other. At 8 hours, it brings the right amount of tart in your yogurt – just like the way it should be. When mixed well, the set yogurt had a smooth and silky feel to it which makes it perfect for smoothies. There were some water droplets inside the cover of the glass container other than that nothing worth writing about. 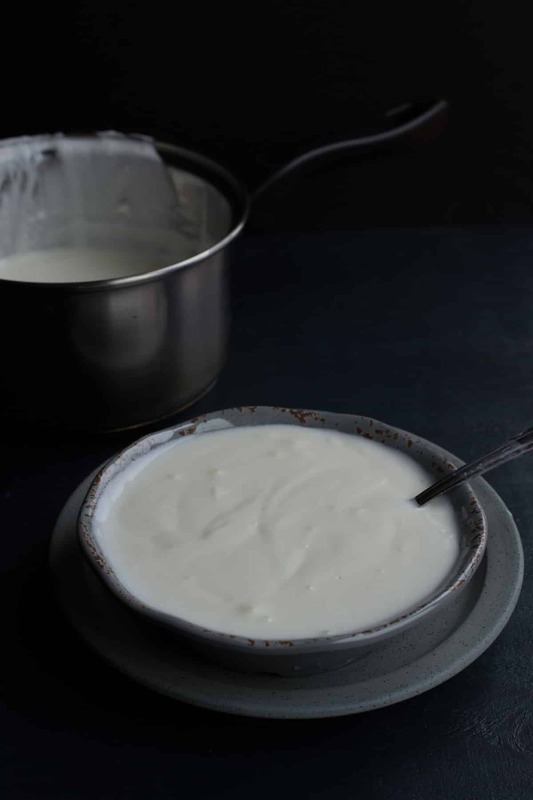 Setting time – It is getting cold here in Chicago and I was surprised that the yogurt made via traditional method was ready in 8 hours (when kept inside the oven with the light on.) The ones made via Instant Pot consistently set in 8 hours. Ease of preparation – The traditional method is the easiest method but may not be the most reliable one when the temperatures begin to drop outside. I liked the Saucepan + Instant Pot + glass container method because I know when it gets really cold in Chicago, no matter what I will have a pot of yogurt ready for me in the morning. Also, it is faster than making it only using the Instant Pot. What method do you like the best? Let me know via the comments below. To get notified about new recipes, come be part of our community on Facebook. Affiliate Disclosure – I am grateful to be of service and bring you content free of charge. To do this, some of the links on this post are affiliate links, which means that I may earn a commission (at no cost to you) if you click on the link or make a purchase using the link. I only recommend products that I use and love myself, so I know you’ll be in good hands. Your support in purchasing through these links goes towards maintaining this website. Thank you! Have you tried making with 1% milk? May I get the recipe please? No, I haven’t. 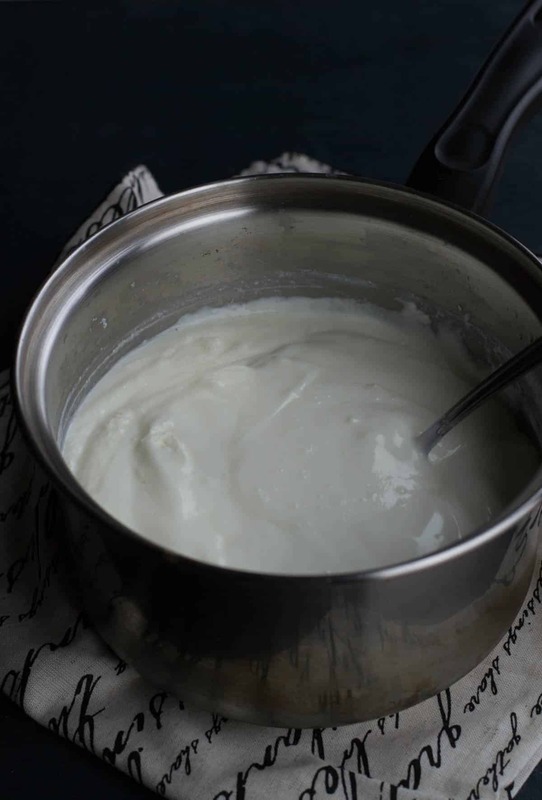 Here’s a good article for you to read on making yogurt with 1% milk – https://www.culturesforhealth.com/learn/yogurt/choosing-milk-for-making-yogurt/. It says that it will be thin. 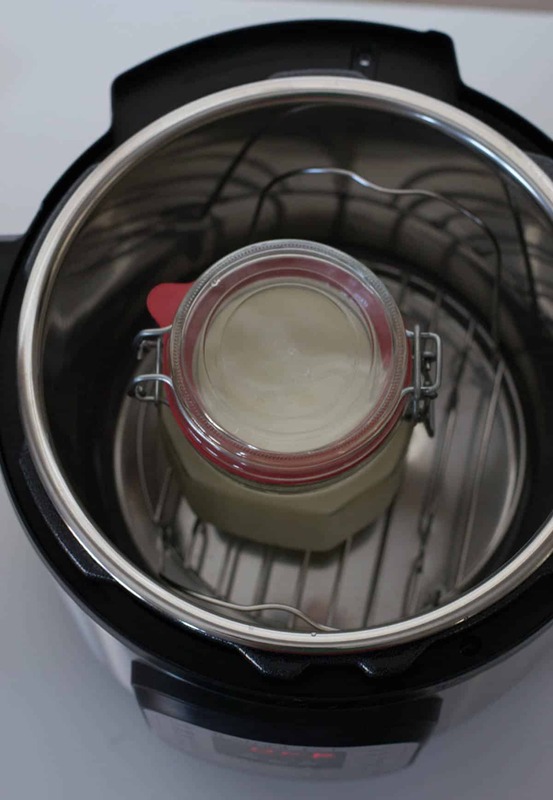 In your saucepan+IP+glass container method, when I set “Yogurt” mode and close the lid should the vent be sealed or vented? Pooja – you are welcome. It can be set to venting as well as sealing. Hi Anu, I have never made yogurt before in my Instant Pot and I was wondering if I cover must the glass container the milk goes into with something like foil? The only glass containers I have are Pyrex bowls, which have plastic lids (which I do not want to put in my IP). Hi Kanan – Cover it with a foil and you should be all set! Is it possible to make yogurt in the IP without the yogurt setting. Lovely step by step instructions!! I am going to try your 3rd method. To me it seems to be the best as I dont have to watch milk boiled in a saucepan and monitor it from overflowing! Thanks,DVR. I would agree the 3rd method is the best! When you use a glass jar, if it has a seal or screw top lid .. is that ok to put in the instant pot sealed already with the milk inside. Or does that risk breaking? I have closed the lid and it has worked out okay. Hi. I’d love to try your 2nd method which requires a glass container. Could you please tell me what kind of glass container you used in the photo and what size it is? Thank you. Thanks for your recipe. My wife and I are vegan and would like to try making yogurt in IP at home. Any ideas? Have you tried making vegan yogurt? Do you know what the best vegan culture would be?